Do you have a sassy princess dog? If so, this 1/4 inch vinyl collar is PERFECT for them! This collar features rhinestones in gorgeous filigree settings. These settings make this collar have just enough extra BLING for your sassy princess! You can get this collar in Red, Black or Blue all with clear stones. 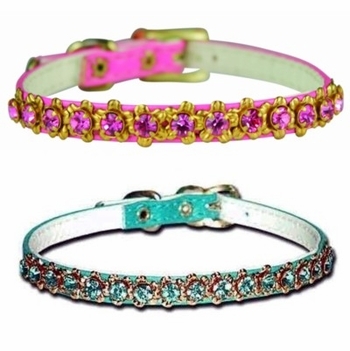 If clear stones is too boring for your princess try this collar in Gold with reflective stones, Silver with light blue stones, Pink with pink stones or Turquoise with turquoise stones. These collars tend to run a little small. Please, take note at the below size chart. 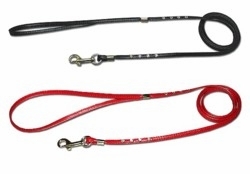 Size 10 will fit a dog with a 7-1/2 to 9 inch neck. Size 12 will fit a dog with a 9-1/2 to 10-3/4 inch neck.